I’m going to be honest; I used to hate to decorate for Christmas. I can’t believe I just admitted that, but, the truth is I have always felt a little overwhelmed by all the “stuff” that we pull out of closets around the holidays. After becoming more active on Instagram and seeing all the absolute beauty that is created with holiday decor, I’ve changed my attitude. 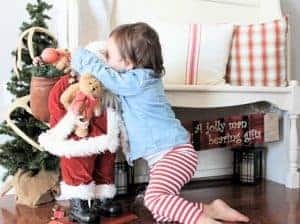 Throughout the rest of this post I will explain how I’ve created this change of heart and why you won’t see my Christmas tree on this CHRISTMAS HOME TOUR (not this year at least). The first thing I had to tackle mentally was realizing why I hated decorating for the Holidays. One word would describe this reason: holiday CLUTTER. Only in the past few years have I started to really collect pieces of holiday decor that I enjoy decorating with. Until then we have had lots of hand-me-downs that, honestly, I could have done without. My husband is very sentimental (I wish I could say I was more like this, but my minimalist loving heart only see’s extra junk) so we have a lot of ornaments and keep sakes that are very dear to him and NEED (for his sake) to be seen around the house during the Holidays. I would love to say my holiday and Christmas decor is everything I wanted it to be and more, but no, it has been a slow process. My Christmas tree is decorated with lots of old sentimental ornaments and pieces my kids have made. My son has suddenly developed a desire to “help” us decorate and insists on decorating the tree which is wonderful! These happy memories of the Holidays and decorating the tree are what I want him to remember the most. Because of this, I don’t have a beautifully styled or “themed” Christmas tree, or fancy Christmas living room decor either. But, for right now, in this stage, this is what matters more; making lasting memories with the family. All this to say, my “mini Christmas home tour” will not include pictures of my Christmas tree or my living room. Not because my tree isn’t beautiful, because it absolutely is, it just doesn’t match the style of the rest of my house or the rest of this home tour. I know, I know, how can you have a Christmas or Holiday home tour without your tree? Because I said so! (LOL, next year I plan to have two trees, one for me and one for the kids). Since we don’t have a fireplace (sniffle, sniffle), I’ve had to be creative about how I hang my stockings. 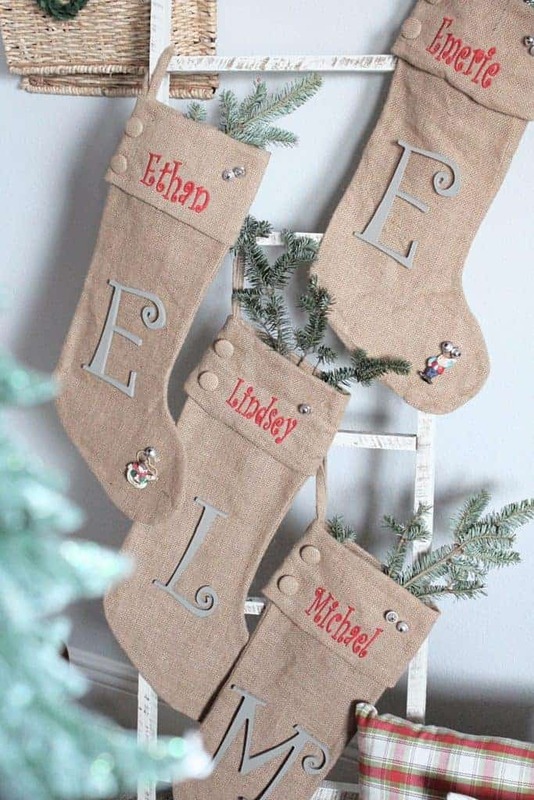 I bought these burlap stockings about 5 years ago and just recently had them monogrammed with our names. I love mixing green and red with earth tones. I LOVE these stockings, and I had to display them so everyone could see them so I decided to hang them from a ladder next to the TV. In the years past I have hung them on the wall or from the bar, but, problem being they weren’t as “visible” as I wanted them to be. So this ladder solved that problem. 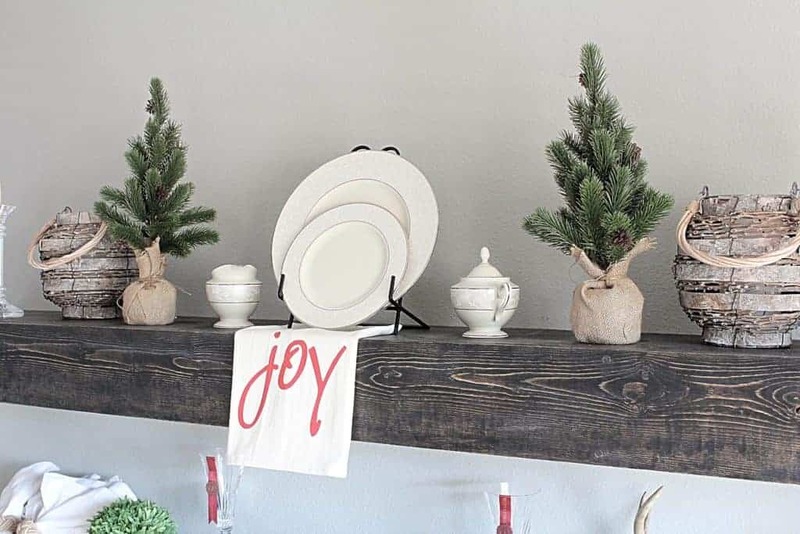 Note: since I wrote this post, I have created my own DIY FAUX FIREPLACE MANTEL. Click the link HERE to check it out. Some of the best and cheapest ways to decorate for the season is with decor from the Target Dollar Spot! No, I’m not being sponsored by them, I just love it that much! This Joy tea towel and the two burlap base trees came from the Target Dollar Spot (and for only $3 each!). You can’t beat a better deal than that! 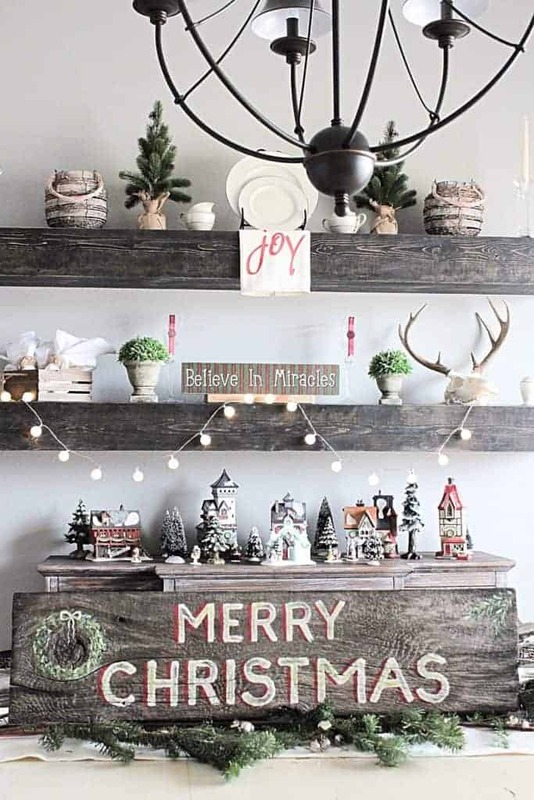 These are my DIY floating shelves (you can see the tutorial HERE) where I’ve added a little greenery, a few lights, and a festive sign. It doesn’t take much to decorate for the season, just a few touches here and there. 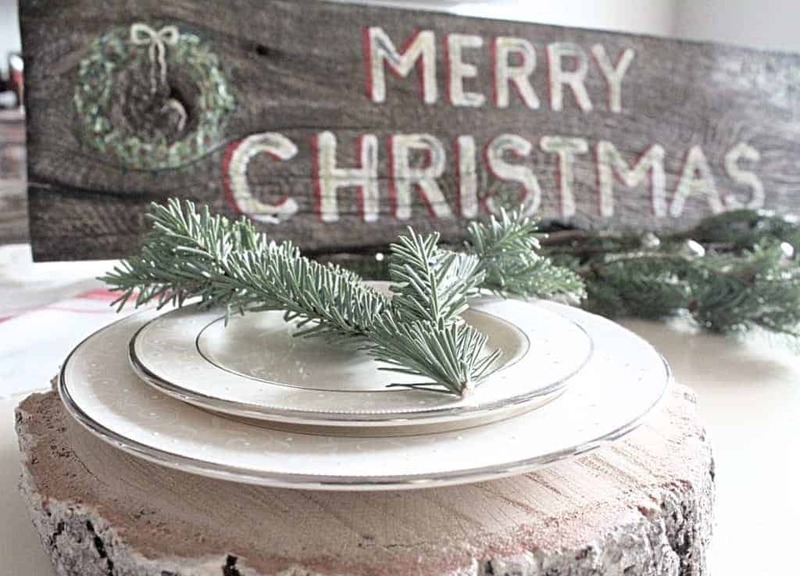 I added a touch of Christmas to my DIY Board and Batten (you can see this tutorial here ). I added some Christmas touches to my entryway to really make this space festive. Once again, the Target Dollar Spot never disappoints with those $3 throw pillows! Also, when you are in need of Christmas tree decor, why not use antlers! lol. You can see my entryway makeover with my $10 thrifted bench transformation HERE . 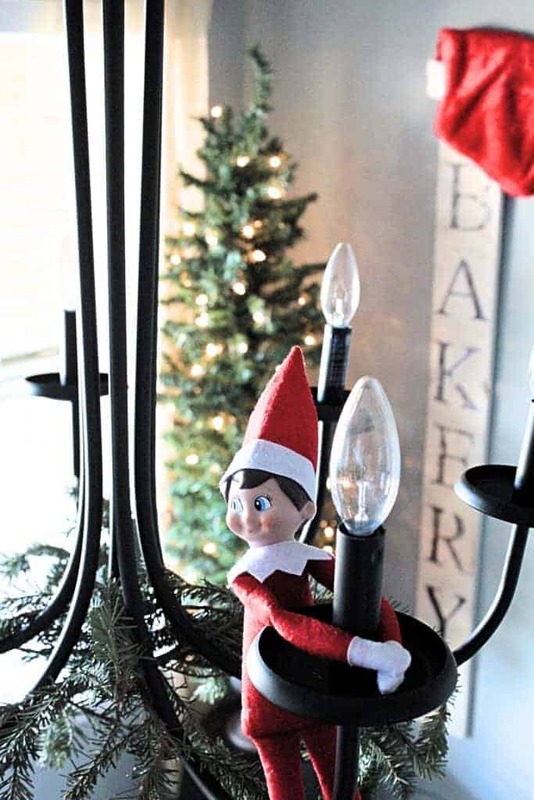 How could I not have a CHRISTMAS HOME TOUR without an Elf on the Shelf! Quick side note; the easiest way to create free and fabulous Christmas decor is with a little garland from a Christmas Tree. I LOVE the way this light fixture looks with a little touch of green. And I couldn’t help but share my DIY Bakery sign with a little flair! This was an easy DIY CHRISTMAS WREATH I whipped up with only a grapevine wreath, some clippings from the Christmas tree and a decorative vine I had laying around the house. I hope this post has inspired you to WANT to create a fun and lovely Holiday Home. 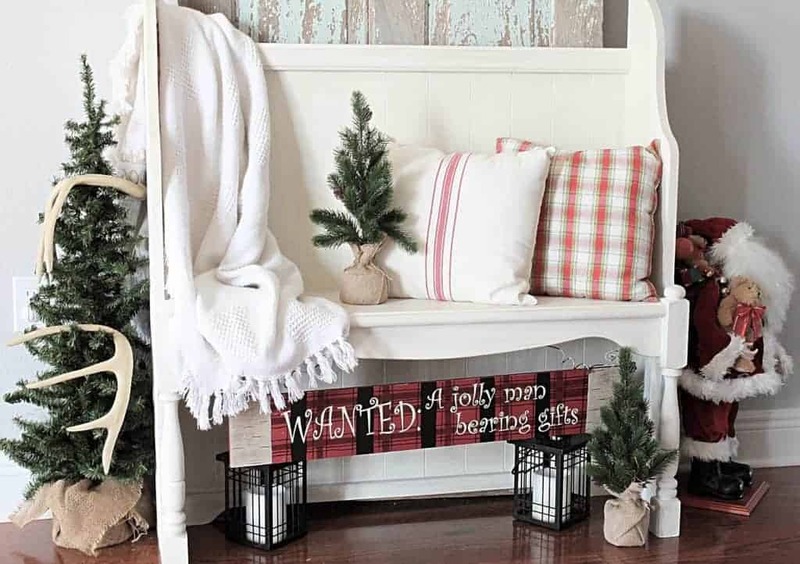 Decorating for the season doesn’t have to be expensive, and I hope I’ve shared some helpful tips on how to add some easy and affordable Christmas decor to your home. I want to share one more sweet pic before I wrap things up, I couldn’t help myself! Disclosure: this post contains affiliate links which means that if you make a purchase off of one of these links I will make a small commission but in no way will you pay more for the product. To see more Seasonal inspiration click HERE. My daughter decorated with similar colors and it is so simple but beautiful! As am empty nester, I have really scaled back my decorating and have specific pieces that go in specific areas. Before I had too many Knick Knacky kind of things, now with the help of Hobby Lobby, I have a living room that is coordinated for Christmas. lol. Hi Karen, I think having too many “knick knack” kind of things just happens over the years And styles change so much too. But doesn’t it feel good to get rid of stuff! Or at least to me it does. Love your home tour. Everything is bright and cheerful and airy looking. This post really spoke to my heart I too am a mimialist heart. My family however wants the sentimental around so my tree is lovely and full of memeries but not pintrest worth either. I am so blessed to read your post by visiting from the Homemaking party! aww thanks so much Suzie for the kind words. I was a little worried my post might come across as cold hearted, but your comments have helped easy those thoughts. Yes, it is hard to keep a minimal home when there are sentimental things you just can get rid of! Your Christmas decor is beautiful. I love the last pic…so cute! Wow, thank you so much! I’m so honored to be featured! This really made my night ladies. Can I take a moment and challenge you? There is something beautiful in the sentimental, the child-like and the mundane. Don’t tuck it away. The story of Christmas is a messy story of a baby born in a barn to virgin far from home and family. It’s a story about love. That’s the story of your tree. Don’t be sorry it doesn’t match! 🙂 Let it shine. You are so right Helene. I went back and forth about publishing this post because I didn’t want to seem “superficial,” but I guess I sort of did. Thank you for your challenge, I always love to hear what my readers say. We get a small tree that grows in a pot. The first year it looks perfect, the second year it always grows weird with a big bare patch in the middle, ditto the third (really weird looking) and then it usually dies and we start again….once the kids are gone, I’m not sure if I’ll bother. My parents still do, so maybe I will…who knows? Now that’s a cool idea! My holiday decor is also full of sentimental items passed down so I’m not sure anyone would be interested in a home tour at my house! Plus, I can’t get my act together to put it up in October, lol!! Visiting from Makers Link Party. Don’t knock your tree. Seriously. I have seen some trees that are just stunning because they reflect the family.Not pinterest or instagram’s version of gorgeous. I can love a good designer tree like anybody. I can also love the empty trees that only have ten ornaments on them and one strand of lights. It’s the feeling it evokes. You do what you like and let the rest fall into place. Even the charlie brown christmas trees are coming back into style. My kids are all grown now, but when they were little, I had all plastic ornaments and popcorn on the tree. Or one year we had just cookies. Which by the way was a mistake. The dog ate most of them. Since we downsized after our kids were grown, we have very little space for decorating, but I haven’t missed all the stuff we used to put out. 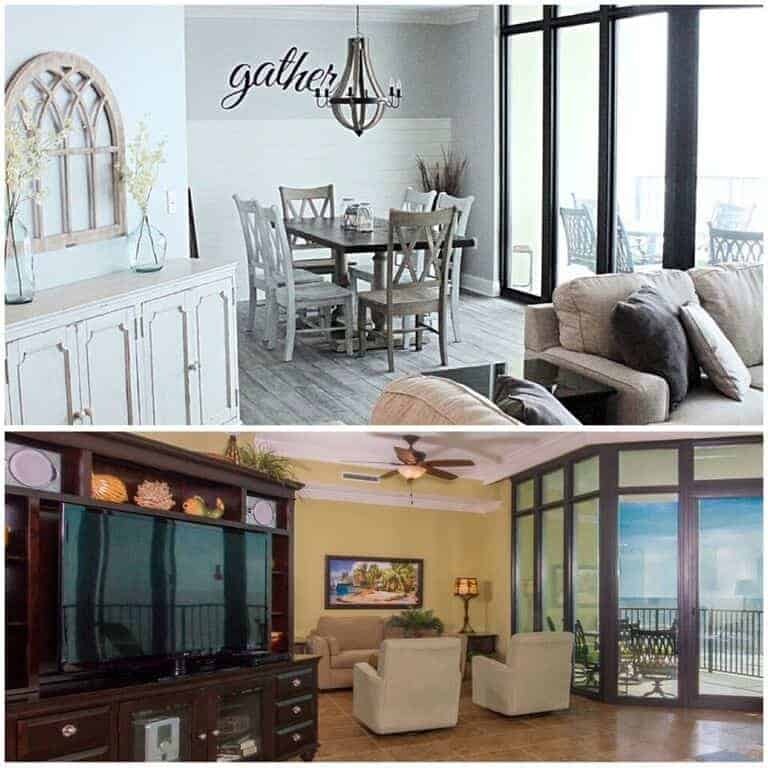 I love the way your home looks! Our tree is the same, in our house it’s the kids (who are all pretty much grown up now) who won’t hear of the tree being themed in some way. They want everything that we’ve ever had on there, including things they’ve made over the years. So on it all goes and that’s that! That’s my plan this year too!- to have my kids tree and then a pretty tree. Thanks for stopping by! I love decorating for Christmas and you have done a great job. My tree is always color coordinated but we no longer have children at home. I totally understand, I too have cut way back on the decorating as the cleanup is all up to me, well, so it the setup…lol. I hope to get the grands to help this year, as I am in the mood. I love the simplicity of your decor. I had so much stuff over the years that just didn’t fit the decor anymore, thank goodness that is all gone now. Have a wonderful Thanksgiving. I hope you have a wonderful Thanksgiving too Karen. Love your Christmas home tour. I particularly like the stockings on the ladder.I don’t think your tree has to coordinate with your other holiday decor. We’ve been collecting ornaments every year since we were married and we bought new ones for our kids each year as well. They are not decorator. They are sentimental–reminding us of Christmases past. Your home tour is so lovely. I think you should show the tree. As beautiful as the decorator trees are, I love the trees with handmade and sentimental ornaments. They have more personality and are as beautiful. I love the stories behind the ornaments. I LOVE your decorations. They are so beautiful. I’m one that doesn’t get real big into decorating, but your post makes me want to decorate! 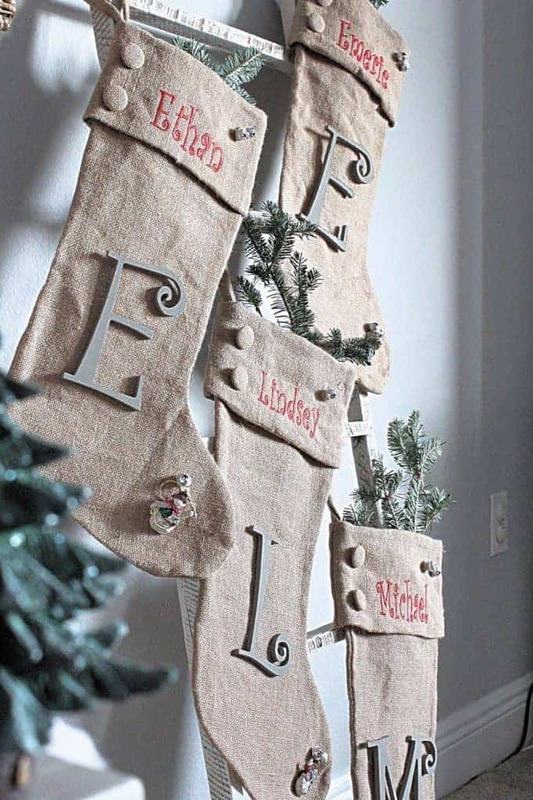 The stockings on the ladder are so cool. 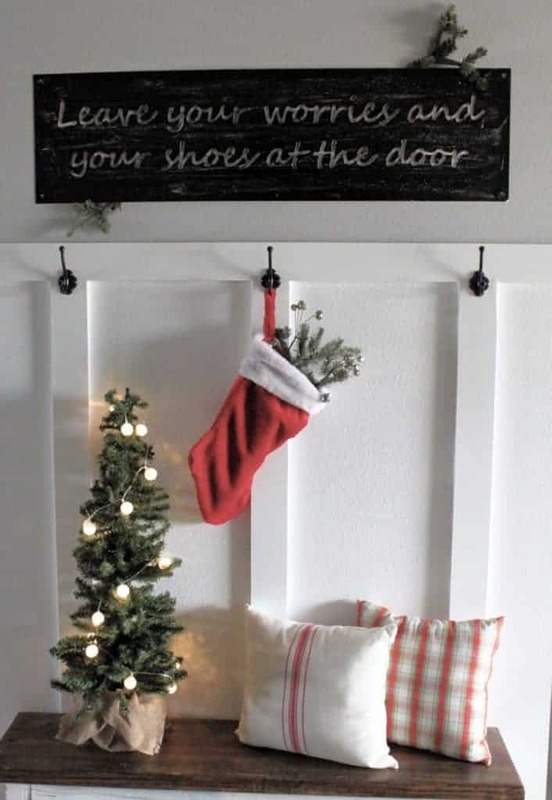 I love the idea of hanging stockings on a ladder, when you don’t have a fire place. Yes, I know what you mean! Before kids I had our tree dec’d out in just gold and white ornaments with wonderful wired ribbons. I tried to make it look like a tree from a department store. After kids, the gold and white is hidden under a sea of paper ornaments from school in an array of all different colors. hehe. I actually have grown to love it more because the tree is so much more meaningful to me. However, that’s a thought…..a second tree where I can have both! win win 🙂 Saw your post at the Tues. with a twist party! Hope you have a wonderful Thanksgiving! Everything changes when kids come along right? Thanks for stopping by! I love the simplicity here. Just beautiful! You did an amazing job decorating. I don’t mind decorating but I hate dealing with all the storage. Loving the sign that says: “Wanted jollyman bearing gifts”! Too cute!!! bwahahahaha love it and all is totally FAB! Thanks for sharing! Yes I understand, I have a few toddlers and a cat. It’s a struggle for sure 🙂 Thanks for stopping by! Oh, I have always loved decorating for Christmas! I use a lot of the same things, but love using them in new ways each year. I love your stockings. The earth tones mixed with red and green is a beautiful combination. That picture of your little one is too cute! Thanks for sharing with SYC. I’m sure it’s not intentional, but I’m not seeing a link back to the party. It looks lovely. We don’t really have anywhere to hand stuff so apart from the tree, our decor is severely limited, but it’s much less a thing in the UK. Our tree only has 2-3 colours on it. Thankfully my son is happy just to help put those things on, any homemade pieces I’ll hang elsewhere round the house instead. Although I may have to get him a small tree for himself if he really wants one. Sorry but I’ve never particularly liked a well styled tree- anyone with some effort can do that. Only a family working together can decorate a tree worthy of Christmas either real or artificial. So not showing your tree because it’s personal that I get but not showing it because it’s not style worthy is missing the point. It looks so pretty! Christmas isn’t about magazine cover style, it’s about making memories, like you say, and sharing with your loved ones. I still don’t have the Christmas decor up but I guarantee you that my tree is a mess because of all the ornaments we make at home. But it’s ours and we always love it anyway. Thank you for joining The Really Crafty Link Party this week! Saw your helpful post on Blogger’s PitStop. I keep mine simple too, using a variety of silk florals around the house. No tree since we are always away at Christmas. I think some people go way over the top with decorations so I’m with you and I love your home decor. You are right when you say it is more about memories and family. Sometimes people forget the real message don’t they? Thanks for sharing with us at #BloggersPitStop and I’ve shared on social media. I totally agree! Thanks for stopping by. I agree, this was last years post and this year I plan to “let the family heirlooms shine (even if they are less than beautiful).” Thank you for stopping by Mary. I hope you have a wonderful weekend. Love all your decorations! Thanks for sharing on Friday Frenzy Link Party! Ups sorry forgot the #kcacols tag! Your photos are gorgeous and still shows the spirit of the holidays so well! I’m not planning on putting my tree up this year and, instead, am creating a winter theme that feels festive, but without all the clutter. Thanks for the inspiration! There ya go…one for you and one for the children! Perfect idea! I used to have to do that years ago when my son was little. (He’s nearly 40 now, so that’s been awhile back. Gosh…suddenly I feel REALLY old!!!) It’s a great compromise. Your family gets to make memories, and YOU get a designer-style tree that makes your heart extra happy! My husband, too, develops a sentimental heart for what I consider “junk” and I let him win on a small bit of it. I try to put the “junk” in more obscure places (without outright hiding it!) or places where HE can truly appreciate it. It works for us somehow. 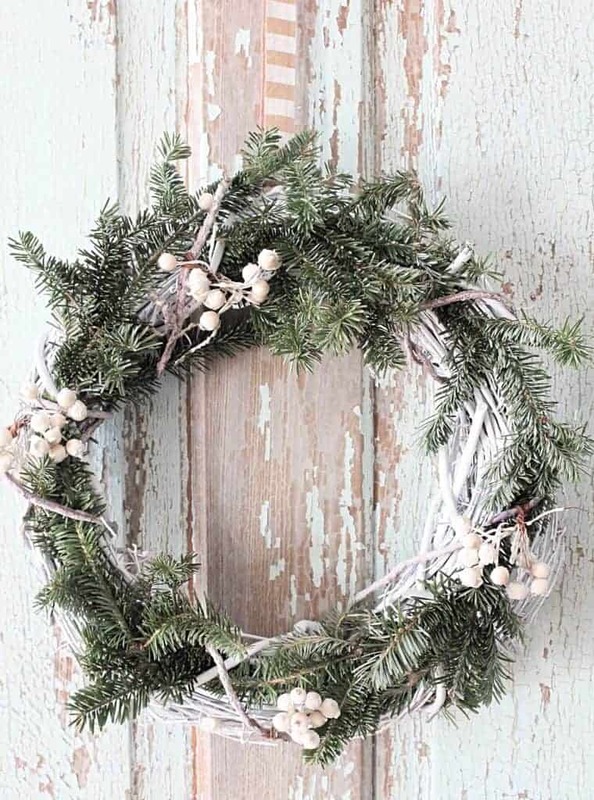 Your Christmas decor is very pretty, and I like how you’re able to incorporate DIY projects that look so fabulous! I”m not much of a DIYer, but I can sure appreciate the talents of others who have it down to a science! ANd $3 throw pillow at Target??!!?!??! Haven’t seen them here! Gotta keep my eyes open for that bargain! Yours look great in your entry! Happy decorating!!! Thank you so much! And thanks for stopping by. Have a great week Alycia. Very pretty! Thanks for joining the To Grandma’s House We Go link party! Your post has been pinned! It all looks great, I love all the Christmas bits & pieces you ahve especially th wreath and stockings. Thanks for linking up with #KCACOLs, hope to see you again next week. Your home is lovely even without the tree!!! Love those gorgeous stockings!! Thank you for sharing your mini home tour with us over at Waste Not Wednesday. Thanks for sharing your home tour with us at Waste Not Wednesday link party. I love all your special touches all throughout the house and love that you are focusing on making happy memories with your family. Family first and building those memories are so important. In our home we had an all white Christmas tree for 30 plus years When the family was all home it was in my bedroom and they had their gawd awful tinsel covered tree in the living room. They remember that and how I let my decor tree be second to the family tree. Your tour is beautiful as is little one. Merry Christmas to you!!! If I had my way there would only be a tree up. The Mrs would have decorations hanging from any and every piece of blank space. I love some of the pieces you have here. Everything is gorgeous! I am featuring when my party opens up tonight. Oh Wow! your home and decorations look beautiful. I may put up a couple of pictures of our tree but that will be all.